I made this lunch for my 9 year old nephew. He requested bagels and a soccer theme. I was happy to work within the restraints. I like this soccer theme. Great imagination! Where do you get your inspiration from? I am amazed by all your ideas! Thank you so much. I spend a lot of time thinking about how to make food cute. This one was easy because my nephew provided the food idea (bagels) and theme (soccer). I then had to figure out how to make a bagel look like a soccer ball. I am not sure how much I succeeded by itself but the other elements in this lunch help identify the theme. Very creative! Always love the interesting bakes! 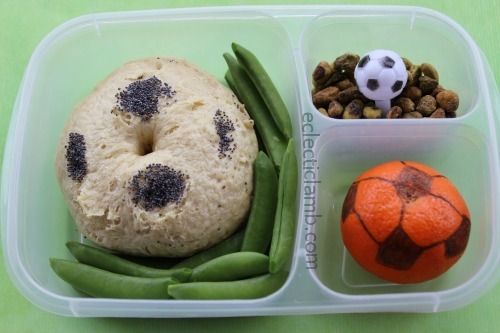 Genius to use bagel as a soccer ball! I love the entire creative bento!